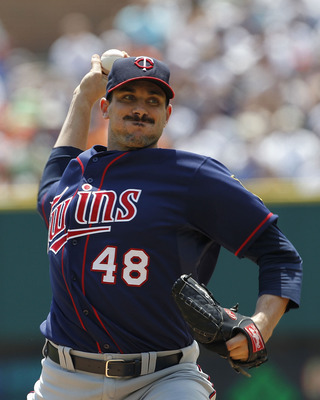 Twins want to keep Pavano, will the price be too high?? According to a tweet earlier from Sports Illustrated’s John Heyman (link), the Twins would like to retain Free Agent Starting Pitcher Carl Pavano. According to sources there are as many as 7 to 8 teams looking to lock up the veteran right handers services for 2011 and beyond. One of those teams are the Florida Marlins along with the Twins. Pavano is said to be seeking “Ted Lilly money”. You will recall that Ted Lilly signed for 3 years $33 million at the start of the offseason. Obviously it would be nice to have Pavano back in the starting rotation for 2011 but is it really worth eating up $11 million/year when the team is reportedly on a tight budget for this offseason? With the Cuddyer and Nathan contracts coming off the books next year; it becomes a little easier to maek some moves but does not leave much wiggle room for this year. With Gibson potentially ready to come up and make an impact in 2011 and a glut of Starting Pitchers that could be used as trade bait this offseason…..would it be smart for the Twins to let the beloved Pavano walk? Of course Pavano is a Type A Free Agent and the Twins will almost certainly offer him arbitration. It is hard to imagine Pavano would accept considering the weak market for Starting Pitchers and the strong two years he put up with the Indians and Twins. I am split on this one. I feel Pavano was a major reason the Twins won the AL Central last year but also feel he could be someone who prevents the team from improving themselves this offseason if he is resigned. I guess that’s why Bill Smith and company get paid the big bucks to make these decisions and not me. I am sure I will be talking about this subject much more during the offseason. Feel free to comment and stay tuned….it’s going to be a wild offseason for the Twins.